Recoil Springs and Recoil Control. The kick of a lightweight compact .45 pistol is admittedly more punishing on both you and the pistol than that of a service-size pistol. The engineers at these manufacturers each took a slightly different approach to recoil control. Check the illustration to see the differences. The Springfield V10 uses an ordinary recoil spring and an ordinary recoil spring guide. There’s nothing fancy here, because recoil is partially controlled by the ported barrel. The V10 barrel, per its name, has two rows of five ports in the forward portion of the barrel, arranged in a “V” if envisioned from the front or rear. These exhaust ports vent the propellant gases up, forcing the pistol down, countering recoil. The standard recoil spring has 22 lbs. of force, but many folks will want to use a 24-lb. spring to make it easier on the pistol. The Heckler and Koch pistol uses a slightly different approach to control recoil and lessen the pounding on the pistol. 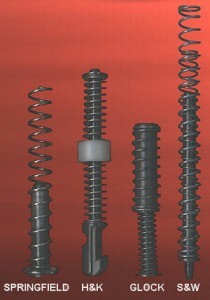 Their captive recoil spring uses a strong, flat spring to pack more recoil absorption into the small space available. This spring is surrounded by a polymer buffer which helps to absorb the pounding of the slide. H&K says this little buffer should be replaced when it gets beat up badly, and replacement spring and buffer assemblies are easily obtained. Still, you should get many thousands of rounds fired before the buffer begins to get pounded out of shape; probably more than you would fire in a lifetime. Glock uses a two-stage captive recoil spring assembly to tame recoil in its Model 30. It utilizes two springs, one of which collapses within the other through a guide tube. This gives progressive control of the recoiling slide and allows easier slide retraction. It is quite effective in reducing perceived recoil, as well. The Smith & Wesson 457 uses two counter-wound springs, one within the other, to achieve recoil absorption. This is similar to the factory Colt Officer’s ACP system, and is found in other S&W compact pistols, as well. It functions well to keep the aluminum frame from being battered by the steel slide. Each of these systems works admirably to help dampen the recoil generated by a lightweight pistol firing a heavy cartridge.